(Lisle) Saint Procopius Academy "Red Wings"
Lisle (population: 21,282) is a western suburb of Chicago, located about 30 miles west of the big city along the DuPage River and was first settled in 1830 by Bailey Hobson. Two years later, James & Luther Hatch permanently settled in Lisle after the Black Hawk War as farmers, and started the trend towards having others joining them. The community is located in DuPage County and had ties to the dairy industry for many years. As unusual as it may seem, the residents of Lisle did not incorporate until 1956, over 125 years after the first settler came. US Route 34 (also known as Ogden Avenue) is the major route thru Lisle, alolng with Illinois 53. Interstates 88 and 355 also bring commerce thru the area, bus service from Pace also available, and the Chicago, Burlington, and Quincy RR provide rail service along with Amtrak and Metra for those that work in Chicago. St. Joseph's Creek also runs thru the community. St. Procopius Academy began as an all-boys' school in Chicago in the year 1887, located at the corner of 18th and Allport Streets as a day school in the Pilsen neighborhood (near West Side) and led by Abbot Jaeger Nepomucene of the Order of St. Benedict at the head of the Benedictine order. The school remained there until 1901 when the founding fathers moved it to Lisle to join another school that had been opened the previous year, St. Joseph Bohemian Orphanage. The school was located at the present-day facility of Benedictine University, where it was also affiliated with St. Procopius College. The main building was added onto in 1907 and again in 1922, while a second building was erected in 1915, followed by a gym/power plant in 1925, and physical sciences building in 1943. St. Procopius was a resident of Bohemia in the Czech Republic that lived in the 10th and 11th Century, ordained to the priesthood around 1003 to the Eastern Rite (also known as the Eastern Orthodox Church). He became a hermit and devoted his life to teaching and serving by establishing a monastery in the Sazava Valley, which survived until 1785. St. Procopius died in 1053, and was canonized as a saint in 1204. 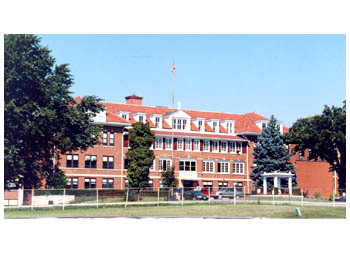 The school stayed at the same location until 1956 when St. Joseph's was closed, and the high school moved to a new location in Lisle. The high school remained all-boys' until 1967 when the all-girls' Sacred Heart Academy came over and helped open up Benet Academy on the St. Procopius Academy campus. Go ... go ... go. We are certain that St. Procopius offered football, basketball, and track to its all-male student body, according to what has been found on the IHSA website (www.ihsa.org). Is it possible that other sports such as baseball, golf, tennis, or wrestling may have also been offered to the students? If you know if they were, please let us know so that we add that information to this page. The Red Wings were successful on the gridiron, as it built the program in a steady manner. We are not certain if they played in a conference with other schools such as Aurora Marmion, Wheaton St. Francis, or Elmhurst Immaculate Conception, but St. Procopius was competitive, especially under coach Ron Baumgartner from 1951 to 1966. The best seasons in school history are below. In the winter, St. Procopius started with a bang, winning four district titles in the first seven years that there was a team under coach Milo Harshberger's tutelege, and continued from there. Years later as Benet Academy, the school would set a state record with 102 consecutive victories in St. Joseph Gymnasium, which was also the home court of St. Procopius. The Red Wings did have one individual go to the state meet as a St. Procopius student came home with a top-five finish for his efforts. "Officially, I never attended St. Procopius--I was a member of the initial freshman class of Benet Academy in 1967. How and why I learned the fight song is a bit of cultural history of Catholic High School education in DuPage County. The county's only high school until the late 1950s was Immaculate Conception in Elmhurst. St. Francis in Wheaton opened in (I believe) 1957 or 1958. The number of Catholic choices doubled with the addition of Diocesan schools Driscoll Catholic in Addison and Montini Catholic in Lombard, both of which opened in 1966 with freshmen only. With more competition, the schools began to pay attention to 8th graders from Catholic elementary schools, inviting them to attend events like football and basketball games. A Proco junior who lived in my neighborhood invited me and an 8th-grade classmate of mine (whose sister went to Sacred Heart Academy) to go to games with him. I was intrigued by St. Procopius because it was an all-boys school (my older brothers attended St. Francis). School spirit was important, and he advised me that freshmen would be stopped in the hallways and asked to sing the fight song, so, with his help, I listened and learned the words that year. On the final day of classes in Spring, 1967, a joint announcement was made at St. Procopius Academy for boys and Sacred Heart Academy for girls that the schools would be combined as co-educational Benet (rhymes with Senate) Academy (ostensibly to be able to compete with the 'new' schools, which were co-ed). The girls would move across Yackley Avenue to the Proco facilities. When we arrived for football practice in August, sure enough, upperclassmen stopped frosh in hallways and the locker room and demanded we sing the fight song ... of course, the 'old' fight song worked. The first day of class in 1967, we were taught the NEW fight song, with new 'Benet' words--and 'coeducational' lyrics. The current upperclassmen were unmoved ... if frosh were stopped in a restroom, lockerroom, hallway or bus, we were required to sing the 'original' lyrics. "Disappointing" the upperclassmen by not knowing or not singing the lyrics was not recommended ... today, the 'consequences' would be called "hazing." I love your site ... it's living history. Thanks for doing it." "I believe my grandmother, Emily Novak and her brother, Stanley Novak were in the training school around 1915. They were in the orphanage, and my grandmother learned secretarial skills, and my great uncle learned shoemaking. My grandmother was employed as a secretary and was able to save enough money to buy a house for her family (her father, and brothers). Both my grandma and her brother were in the orphanage when my great grandmother was ill and hospitalized for a long time, and her father, an unemployed carriage maker could not care for the children. My grandmother hated her time in the orphanage, but my great uncle Stanley liked it. He was proud of the fact that he didn't have to sleep in the baby room, where the kids still wet the bed."